Summary: A 45-year-old woman presented with subacute encephalopathy due to autoimmune Graves disease. MR angiography (MRA) demonstrated stenosis of the major intracerebral arteries. After high-dose methylprednisolone therapy and plasmapheresis, her neurologic status improved dramatically, and the MRA findings resolved after 3 months. The angiographic findings in Graves disease that resemble those in Moyamoya disease are temporary. Autoimmune thyroid diseases such as Hashimoto thyroiditis, Graves disease, and idiopathic thyroid failure are associated with several neurologic disorders. Of the three, the neurologic complications of Hashimoto thyroiditis, which causes acute or subacute encephalopathy, strokelike episodes, epilepsia, tremor, or myoclonus, have been described in the greatest detail (1). Although about 30 cases of Hashimoto encephalopathy associated with hypothyroidism or euthyroidism have been reported in the literature, similar signs have been reported only in three cases of Graves disease (2). As a result, it is thought that autoimmune disease has likely caused cerebral events rather than thyroid status at that time. Neuroradiologic examinations have been performed in a limited number of cases with encepalopathy due to autoimmune thyroid diseases; the findings include diffuse or focal white matter hyperintensity at T2-weighted MR imaging in Hashimoto encephalopathy (3) and multiple vascular stenosis or findings similar with Moyamoya disease at cerebral angiography in Graves disease (4–7). In this report, we describe reversible angiographic findings mimicking Moyamoya disease at MR angiography (MRA) in a woman with a strokelike episode and encepalopathy diagnosed as Graves disease and discuss the probable etiopathogenesis of the disease. A 45-year-old woman was admitted to our department with drowsiness, hallucinations, and incontinence of urine and feces. She also had experienced weakness in her right arm and leg and dysarthria for 2 or 3 days, and this problem had been present 2 months earlier. She had experienced disorientation for the past month. Her incontinence had begun recently, and her consciousness was deteriorating gradually. Her family history was noncontributary. On physical examination, a slightly diffuse goiter, fine tremor in her hands, minimal exophtalmia, and tachycardia were detected. Deep tendon reflexes were increased, and plantar flexor reflexes were absent bilaterally. Findings of biochemical studies, complete blood count, and brain CT obtained on admission were normal. Diffuse slowness in background EEG activity was detected, and brain CT findings were normal. Levels of lactic and pyruvic acid in CSF and ammonia in serum were found to be within normal limits. No pathologic finding was detected in CSF examination, except for slight pleocytosis. ANA, anti-DNA, p-ANCA, HSV1 IgM and HSV2 IgM titers were negative. Free T3, free T4, TSH, ATG, and anti-TPO levels were found to be 13.8 pg/dL (normal range, 1.8–4.2), 5.07 ng/dL (0.8–1.9), 0.001 IU/mL (0.4–4.2), 418 IU/mL (0–40), and 1000 IU/mL (0–35), respectively. Bilaterally diffuse hyperplasia was detected on a thyroid scan. Graves disease was diagnosed, and 150 mg/day propylthiouracil and 120 mg/day propranolol were administered, but no change was detected on the patient’s neurologic examination. Brain MR imaging findings obtained at this time were normal, but severe stenosis was seen in both distal internal carotid arteries (ICAs) and arteries distal to the basilar artery on MRA images (Fig 1A and B). Methylprednisolone (1000 mg/day) was given to the patient, whose thyroid antibody was strongly positive in the first week following 3 days of hospital admission, after which the dose was reduced to 80 mg/day. In the 12th day of hospitalization, the patient’s clinical status improved, and tests for thyroid function showed the following: free T3, 2.46 pg/dL; free T4, 2.98 ng/dL; TSH, 0.02 IU/mL; ATG, 30.3 IU/mL; and anti-TPO, 186 IU/mL. In consultation with an endocrinologist, plasmapheresis was performed three times, and the clinical findings improved rapidly. After 1 month of hospitalization, the patient was discharged with treatment of 20 mg/day prednisolone and radioactive iodine. She was examined after 4 months. There was mildly increased deep tendon reflexes and fine tremor bilaterally on neurologic examination. MRA findings at that time were normal (Fig 2A and B). 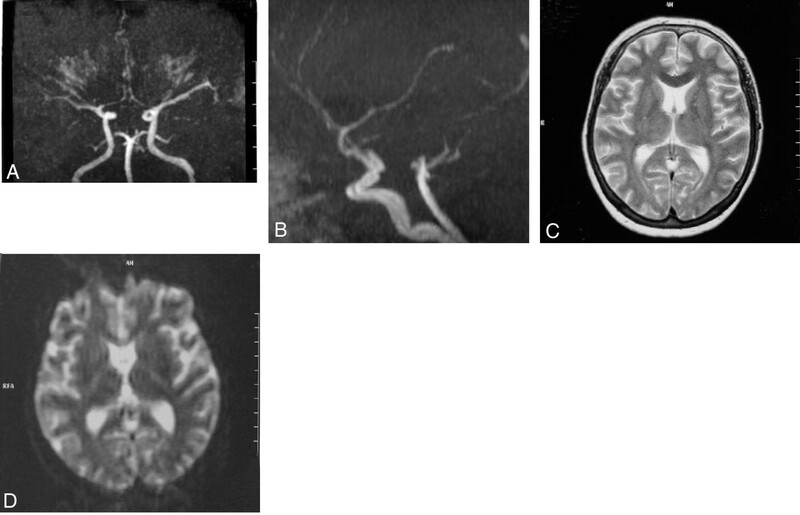 Cranial MR angiography shows severe nonuniform stenosis of both distal ICA in the coronal (A) and sagittal plane (B). Axial T2-weighted (C) and diffusion-weighted (D) cranial MR images are normal. The resolution of vasculitic changes after treatment on MR angiography 4 months later in the coronal and sagittal planes (A and B). Axial T2-weighted cranial MR image (C) remains normal after treatment. Encephalopathy due to autoimmune Graves disease was diagnosed in our patient on the basis of strokelike episodes, subacute encephalopathy, thyroid function, and thyroid antibodies. This disease presents clinically with variable symptoms, such as seizures, neuropsychiatric changes, or focal neurologic deficits. Cases of hyperthyroidism with signs similar to Hashimoto encephalopathy associated with hypothyroidism or euthyroidism have occasionally been reported in the literature. Because of the heterogenity of underlying thyroid disorders, it is suggested that the term “encephalopathy associated with autoimmune thyroid disease” is more appropriate than “Hashimoto encephalopathy” to describe these clinical conditions (3). In our patient, findings such as peripheral signs of hyperthyroidism, somnolence, and confusional state are thought to be associated with thyroid dysfunction, but hemiparesis, dysarthria, and pathologic reflexes are thought to be associated with vasculitic changes due to autoimmune thyroid disease. The pathogenesis of the cerebral findings seen in the Hashimoto thyroiditis and Graves disease is controversial. The most probable factor is felt to be a defect in cerebral perfusion in autoimmune cerebral vasculitis due to deposition of immune complexes (3). This theory has been supported by a report (8) showing the T-lymphocyte infiltration in venules at the brain stem in the necropsy of a case with Hashimoto thyroiditis. The lesions on T2-weighted MR images obtained in a limited number of cases with Hashimoto encephalopathy show hyperintense lesions in the brain. It was thought that these lesions were caused by the vasculitis due to the antibodies against the brain and the thyroid tissue (9). Findings similar to the Moyamoya disease or isolated segmental arterial stenosis were shown at cerebral MRA or conventional angiography performed in the cases with Graves disease associated with encephalopathy or strokelike episodes in recent years (4–7). The association of Moyamoya disease and Graves disease in these cases is explained by the same autoimmune mechanism (10). There are also several reports about the role of T cell-mediated immunity in Moyamoya disease associated with stenosis or occlusion of bilateral ICA (11). Angiographic findings associated with or without “rete mirabilis” similar to Moyamoya disease have been detected in other autoimmune diseases such as systemic lupus erytamatosis, Sjögren disease, and antiphospholipid syndrome (12–14). Improvement in the angiographic appearance was detected after anticoagulation treatment only in one of these cases, specifically the one who had the finding of Moyamoya disease associated with antiphospholipid syndrome (12). The radiologic findings were not reported in the other cases. In our case, the cerebral vasculitic changes improved after treatment with plasmapheresis in autoimmune Graves disease, and we believe that elimination of thyroid antibodies from circulation by plasmapheresis had an important role in the reversal of vasculitic changes.